Endangered snake: One of Minnesota's new candidates for the endangered species list is the Eastern massasaugas rattlesnake. Several species of animals and one plant in Minnesota are on the candidate list for being added to the U.S. 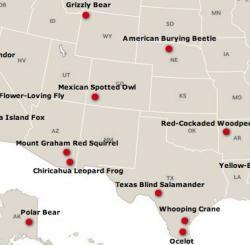 Fish and Wildlife Service’s list of threatened and endangered species. Making the list from Minnesota are the Eastern massasauga rattlesnake, Dakota skipper butterfly, sheepnose and spectaclecase mussels and slender moonwart plant. The Minnesota Department of Natural Resourses announced the candidates this month along with the U.S. Fish and Wildlife Service. Candidates make the list when research shows that their numbers have dropped to a range where special management steps need to be taken to try to keep them from dipping to dangerously low levels. More information about the list is available by visiting the Minnesota DNR website (www.dnr.state.mn.us). The Eastern massasaugas average about two feet long when fully grown and are grary or light brown with dark blotches on their back and small blotches on their side. They can be found in wet prairies, marshes and low areas along rivers and lake. They hibernate alone in the winter time. 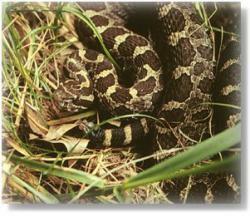 Massasaugas’ diets consist of small rodents along with frogs and other small snakes. 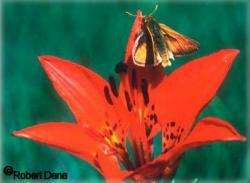 Also endangered: Up for endangered consideration is this butterfly, the Dakota skipper. The Dakota skipper is a small butterfly with a one-inch wingspan. Like other skippers, it has a thick body and a faster and more powerful flight than most butterflies. The upper side of the male's wings range from tawny-orange to brown with a prominent mark on the forewing; the lower surface is dusty yellow-orange. The upper side of the female's wing is darker brown with tawny-orange spots and a few white spots on the margin of the forewing; the lower side is gray-brown with a faint white spot band across the middle of the wing. Dakota skippers occurs in two types of habitat. The first is relatively flat and moist native prairie in which three species of wildflowers are usually present and in flower when Dakota skippers are in their adult stage - wood lily, harebell and smooth camas. The second habitat type is upland prairie that is often on ridges and hillsides. If they attain maximum longevity of about three weeks and if adequate sources of nectar are available, females may lay up to about 250 eggs. Nectar provides Dakota skipper with both water and food and is crucial for the survival of both sexes during the flight period. Dakota skippers appear to prefer plants, such as purple coneflowers, whose nectar cannot be obtained by insect species that do not have a relatively long, slender feeding tube. Wolf: Image courtesy International Wolf Center. Yesterday the Science Museum of Minnesota opened a small traveling exhibition called Living With Wolves in the 21st Century that compares the wolves of North America within a world perspective and examine ways humans determine wolf survival. Coincidentally, yesterday U.S. Interior Secretary Gale Norton initiated a federal plan to move the management of gray wolves in Minnesota and other Great Lakes states to tribal and state agencies. In addition, the U.S. Fish and Wildlife Service has begun the process of taking wolves off the endangered species list in Minnesota, Michigan and Wisconsin, as well as in parts of North Dakota, South Dakota, Iowa, Illinois, Indiana and Ohio, because their populations have recovered under the federal protection of the Endangered Species Act. The U.S. Fish and Wildlife Service estimates that there are nearly 4,000 gray wolves in Minnesota, Michigan and Wisconsin, which is up from between 700 and 1,000 when the gray wolf was listed as endangered in 1974. Read the press release from the U.S. Fish and Wildlife Service for more information. Comments on this proposal can be submitted by e-mail to WGLwolfdelist@fws.gov. 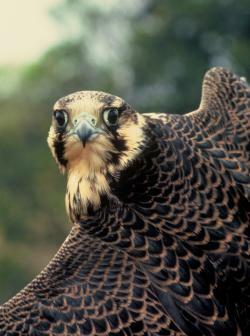 Peregrine Falcon: Peregrine Falcon. Courtesy Craig Koppie, US Fish and Wildlife Service. The peregrine falcons at the High Bridge power plant usually lay eggs in mid- to late March. The female lays one egg every 2 to 3 days, with an average total clutch of 3 to 4 eggs. It's 33 to 35 days until the eggs hatch; during that time, the female spends most of the time on the nest incubating the eggs and the male does most of the hunting and brings her food. Once the young hatch, the female cares for them continuously for the first few days and then her attention slowly wanes as the chicks get stronger. The chicks will remain in the nest for 35 to 42 days after hatching. At some point during this time the chicks will be banded with their identification number and name them so they can be tracked in the future. And this is where you come in. Submit your ideas for names for the potential falcon chicks at the High Bridge power plant in the comment section below. (Names can't be reused, so we've provided a list of those already taken.) If the falcons produce a clutch of eggs, we'll select the best names from your submissions and post them in a poll for everyone to vote on in a few weeks. The top vote getters in the poll will be the names given to any chicks that survive and are banded. So — what do you think? What's a good name for a falcon? Don't forget to check the polls page in a few weeks to see what names have been selected and vote for the best one! It's a pretty amazing world we live in. Dozens of new species are discovered within days of more nearing extinction. I've heard it many times, and it seems almost corny to repeat it, but it has to be true that species have become extinct due habitat destruction, invasive species and who knows what else that we didn't even know existed. Female mountain yellow-legged frog: Image courtesy U.S. Fish and Wildlife Service. An example of one "what else" is the story of what's happening to the mountain yellow-legged frog. This little fellow would seem to be quite the survivor, living up to nine months under snow and ice in the Sierra Nevada range. The populations of these frogs were at one time so great that they were practically a tripping hazard. However this frog is headed towards extinction, fast. But interestingly, it's not entirely our fault. Introducing trout to the lakes that the frogs had called home for sport fishing and forcing them into smaller more isolated lakes has not helped matters, nor has agricultural pollutants transported to the area by prevailing winds, but it turns out the biggest culprit is a fungus. The chytrid fungus has caused frog extinctions in other countries, and grows on the skin of the frog, making it hard for them to properly use their pores to control their water intake — they die of thirst while they are living in water. And it is not just the mountain yellow-legged frog that is dying from this fungus, the boreal toad population in Rocky Mountain National Park is also being decimated by this fungus. And because it is a fungus, not people that are pushing the frogs to extinction, the U.S. Fish and Wildlife Service is struggling to declare the frog an endangered species. Since the fungus is natural and not the by-product of agricultural waste or pollution, it is hard to secure funding to save a frog afflicted with it. Why save a frog that is dying through no fault of ours? What do you think? Should funding be set aside to save species from extinction if they are becoming extinct through natural causes? Or should we focus our resources on trying to save species that are facing extinction as a direct result of our actions? I saw a bald eagle yesterday as I was driving along the Mississippi near downtown St. Paul. Something about those birds makes me want to stop what I am doing and just watch them soar. Hard to do when you're driving. Eagle: Image courtesy U.S. Fish and Wildlife Service. Anyway, that got me thinking that I've seen more bald eagles in the past 12 months from or near the Science Museum than I have ever before. I wonder what is making them more prevalent. Is it the fact that the temperatures are more moderate? Or that the river is not iced over? It turns out that the Mississippi River is a popular location for bald eagles to over winter and even to live year round and it's the open water they like, because it makes hunting easier. Hard to catch a fish that's protected by a layer of ice, I guess. Liza wrote a great blog on eagles about a year ago. Check it out for more information as well as a bunch of great eagle resources.